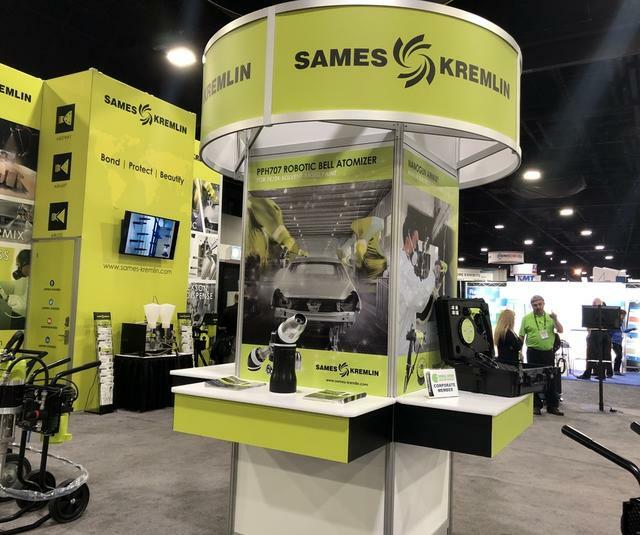 SAMES KREMLIN’s North American subsidiary was pleased to attend the 2018 Fabtech Expo in Atlanta, GA on November 6-8, 2018. Fabtech is North America’s largest metal forming, fabricating, welding and finishing event. Fabtech provides a convenient ‘one-stop-shop’ venue where you can meet with world-class suppliers, see the latest industry products and developments, and find the tools to improve productivity, increase profits and discover new solutions to your metal forming, fabricating, welding and finishing needs. The initial numbers are in – total attendance was 33,755 with 1550 exhibitors showcasing their new applications, products, and services over 650,000 sq. feet at the Georgia World Congress Center. SAMES KREMLIN proudly displayed our new booth which showcased products and applications from each of our (6) product ranges: Airspray, Airmix®, Airless, Electrostatic, Rexson Dispense, and Powder. Deimco also returned to the 2018 Fabtech expo and partnered with us to showcase the inoBell powder applicator spraying powder in the Deimco powder booth. Attendees were interested in the robotic powder application and stopped by for demonstrations. On Wednesday, SAMES KREMLIN participated in the Finishing Technology workshop. Micky Ricard, Systems Application Engineer and Product Manager for Powder, gave a presentation that focused on ‘Powder Coating Defects and Fixing the Problem’. Ray Elsberry, Deimco Sales Engineer, collaborated with Micky during the presentation and assisted with follow-up questions. At the close of the presentation, many class attendees expressed interests and followed-up with questions for Micky and Ray. On Wednesday, two groups of 'Women in Finishing', came by our booth for a tour to learn more about SAMES KREMLIN's products and solutions. We enjoyed spending time with each group and appreciate them stopping by to learn more about our company. Fabtech is the show to attend for Education, Innovation, and Collaboration! We are excited to be back in Chicago in 2019.